In late January 2008, PNB became the first American company to perform Jean-Christophe Maillot’s Roméo et Juliette, with costumes and sets rented from Maillot’s Les Ballets de Monte-Carlo. 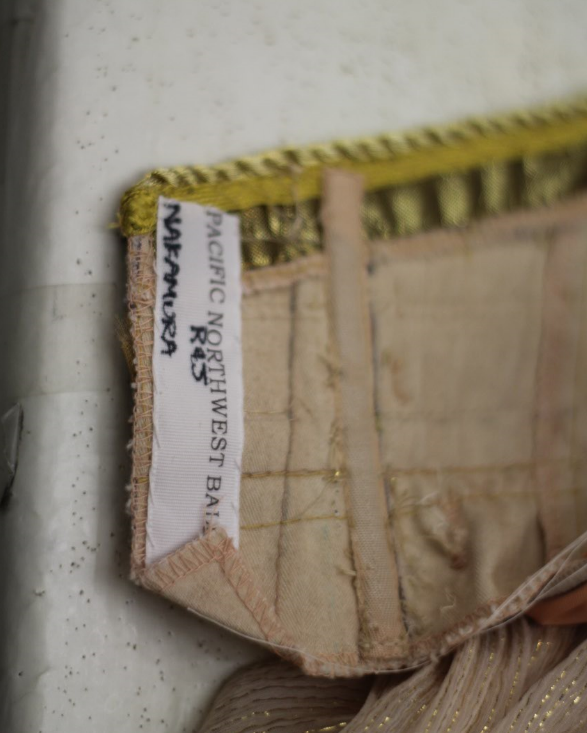 In early 2012, PNB’s costume shop, under the direction of Larae Hascall, shop manager since 1987, began building the Company’s own production. The inspiration for PNB’s first performance and the collaborative efforts behind the creation of PNB’s Roméo et Juliette have their origins a decade or two earlier. 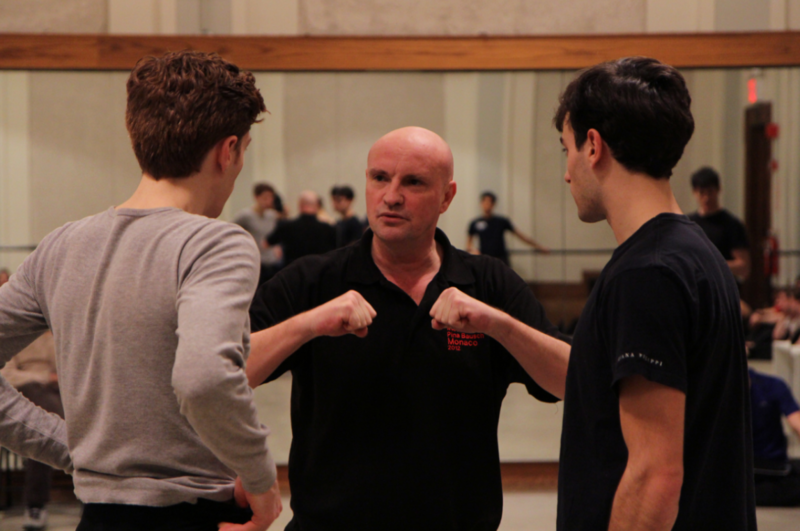 Jean-Christophe Maillot rehearsing PNB dancers. Photo by Lindsay Thomas. May 1999: Les Ballets de Monte-Carlo, under the artistic direction of Maillot, performed his 1996 production of Roméo et Juliette in New York City. Peter Boal was in the audience and described his response: “I saw choreography so fresh and natural that it was hardly choreography at all, but instead an expression of human experience.” He decided that if he were ever an artistic director, he would want to program that ballet. Boal also was briefly tempted by the idea of joining Maillot’s company, and actually auditioned for him in the late 1990s. Maillot offered Boal and his wife contracts with the company, but news that the Boals were expecting a second child changed their plans. Boal had previously met Maillot in Europe in 1988. In fact, four of the individuals playing a significant part in PNB’s own production of Roméo et Juliette (Maillot, Boal, costume designer Jérôme Kaplan, and design assistant for the project, PNB costume shop draper Mark Zappone) all had connections with each other in Europe in the late 1980s-early 1990s. Fall 1988: Boal took a leave of absence from the New York City Ballet and danced three months with the Ballet du Nord in Roubaix, France. While there, he became friends with Mark Zappone, who had left his position as costume shop supervisor/wardrobe master for PNB in 1987 and had accepted a similar position at Ballet du Nord. Maillot at that time was director and choreographer at the Ballet du Grand Theatre of Tours (France), but also choreographed for Ballet du Nord while Boal and Zappone were there, and for Les Ballets de Monte-Carlo in the late 1980s/early 1990s before becoming director and choreographer in 1993. When Zappone moved to Les Ballets de Monte-Carlo as head of the costume shop, he had further contacts with Maillot and also with Jérôme Kaplan, who had been designing ballets for Maillot since 1991. November 2005: Several months after taking over the artistic directorship of Pacific Northwest Ballet, Boal emailed Maillot regarding acquiring one of his ballets for PNB to present in 2008 or following. Not long after that initial contact, Boal and Zappone were in Monte Carlo, attending a performance by Maillot’s company. Roméo et Juliette was the Maillot work Boal chose to bring to PNB, confirming his initial response to that ballet. September 2007 & January 2008: PNB dancers were coached in their roles by Les Ballets de Monte-Carlo stagers Giovanna Lorenzoni, Gaby Baars, Bernice Coppieters (the ballet’s original Juliet), and by Maillot himself. Lucien Postlewaite and Noelani Pantastico in Romeo et Juliette. (c) Angela Sterling; choreography by Jean-Christophe Maillot. Romeo et Juliette costume detail. (c) Lindsay Thomas. Late September-early October 2009: Additional performances by PNB, with sets and costumes again rented from Les Ballets de Monte-Carlo. The title roles were danced by Lucien Postlewaite and Carla Körbes, and James Moore and Kaori Nakamura. Carla Körbes and Seth Orza in Romeo et Juliette. (c) Angela Sterling; choreography by Jean-Christophe Maillot. 2011: During planning for the 2012/2013 season, PNB learned that it would not be feasible to rent Les Ballets de Monte-Carlo’s costumes and sets again; plans to build PNB’s own production commenced. February 2012: As PNB prepared for its premiere of Alexei Ratmansky’s production of Don Quixote, for which Jérôme Kaplan did both scenic and costume design, Kaplan was in Seattle; he examined the costume shop’s realizations of his Roméo et Juliette designs for the principal roles, and had no doubt that PNB would be successful in creating the entire production. Spring 2012 and following: Mark Zappone (who had returned to PNB as costume designer and draper in 2001) met with Kaplan in France, researched and shopped for fabrics in Paris, and then went to Monte Carlo to copy the designer’s patterns and notes to take back to PNB. 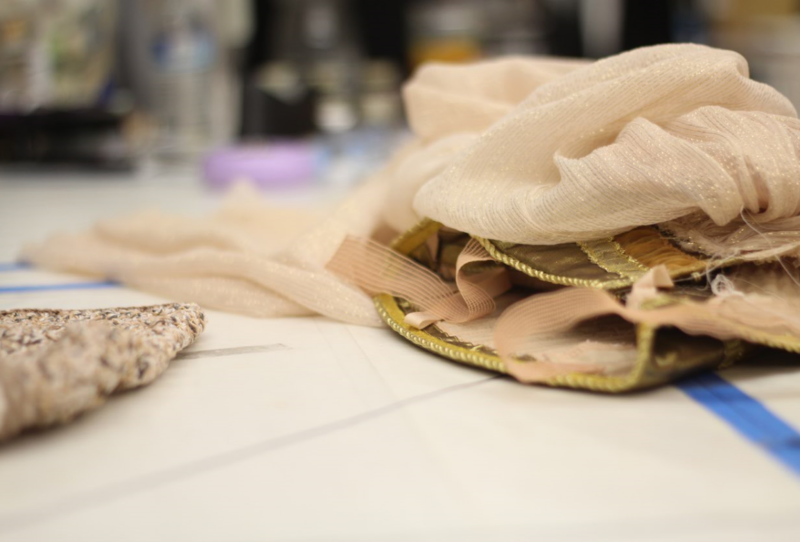 From that point, continuing throughout 2012 and early 2013, Zappone and Robin Emerson (costume shop assistant) sought out additional fabrics that either were the same as those used in the original Monte Carlo production, or were similar—and in some instances an improvement. They found it necessary to order many materials from Europe, but, where possible, they also bought locally. Shops as distant as New York City and France and as close as Queen Anne Avenue were sources for the multiplicity of textiles required for costumes and accessories. For example, fabric for the light gray pleated Montague dresses was ordered in July 2012 from Cristoffe, a company located in France; PNB took delivery one week later. The cost for materials amounted to $289; custom duties and fees totaled $72, while the Fed Ex shipping charge was $281. In September, black silk with silver shot was purchased for $231 from Nancy’s Sewing Basket on Queen Anne. Some fabric companies still stocked the same materials used when Les Ballets de Monte-Carlo built its production in 1996. One agent in France, whom Zappone recently contacted to see if any of the fabric remained, remembered filling the original order 16 years earlier. Romeo et Juliette costume details. (c) Lindsay Thomas. Summer 2012 – January 2013: Throughout the second half of 2012 and early 2013, additional employees hired to work on building costumes for this production spilled over from the costume shop space in the Phelps Center to other available areas on the second floor—as did work benches, sewing machines, voluminous rolls of fabrics, dressmaker models, and costumes in various stages of completion. 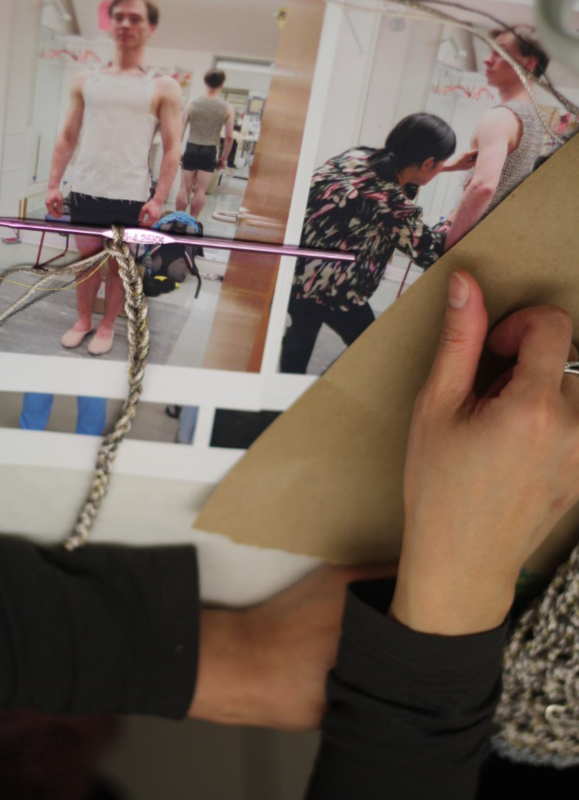 In early December 2012, Jerome Kaplan spent four days in Seattle reviewing PNB’s interpretation of his designs, the fabric substitutes, and the fit on the dancers. February 2016: Romeo et Juliette returns to the McCall stage with Noelani Pantastico as a returned Principal dancer with PNB after 7 years in Ballet de Monte Carlo. She along side Lesley Rausch performed the roles of Juliette. 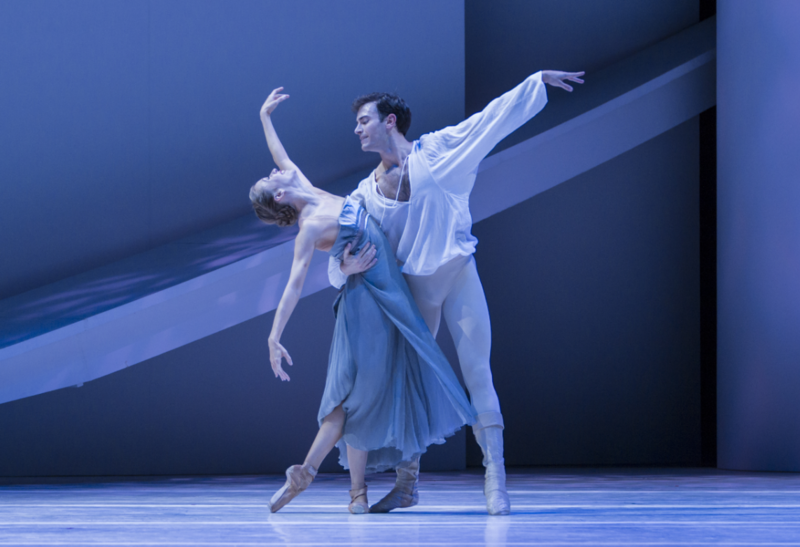 Lesley Rausch and Jerome Tisserand in Romeo et Juliette. (c) Angela Sterling; choreography by Jean-Christophe Maillot. Because of the extended period that PNB has had to prepare this production, Kaplan, in consultation with Zappone and other costume shop employees, has had the opportunity to revisit his original designs, and also to take advantage of improved fabrics that lend themselves to the shape, drape, and movement originally desired. One example of this is the length of Juliet’s costumes: audience members who have seen performances in previous seasons might notice that Juliet’s costumes now are the same (longer) length as those for other female characters, a feature of Kaplan’s original designs. The fabric from Switzerland used in 1996 to construct Juliet’s kimono does not still exist. Through the combined efforts of Zappone and dyer Wendy Oberlin, a cream and gold blend located at Mill End Store in Portland was dyed the desired green/gold color. Kaplan believes the resulting robe is even better than the original, in part because it moves more fluidly. The crocheted tunics (which Kaplan designed to resemble chain mail armor) worn by Tybalt and the Montague and Capulet men provide another example of PNB’s costume shop exceeding Kaplan’s expectations. The designer desired a more powerful look for the crochet than achieved in the original tunics. 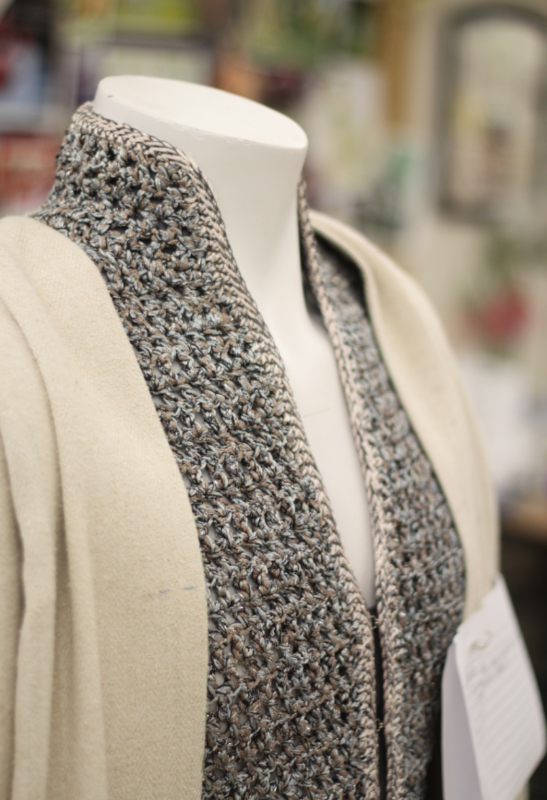 Costume shop first hand Luna Pham, with additional assistance in recent weeks from Aleesha Kobernik and Jule Castner, crocheted approximately 20 tunics that elicited high praise from Kaplan.